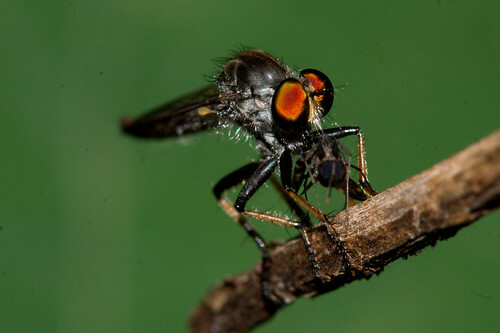 Nature Magnified: What does a robber fly rob? What does a robber fly rob? Robber flies are members of the genus Asilidae and have about 7100 species within. So why are they called robbers? What exactly do they rob? 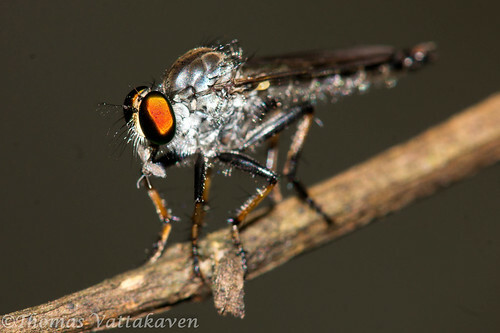 I was photographing the above fly as it was perched on a twig, late in the evening. It didn't remain there for long. It took off abruptly, snatched a mosquito-like fly almost out of thin air and returned to its perch to feed on it. 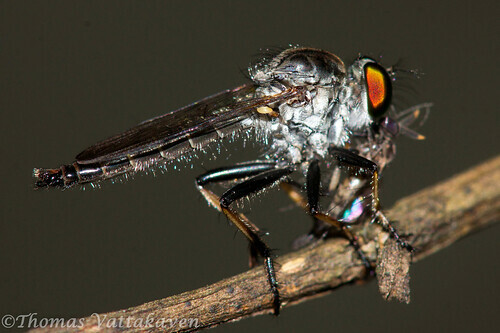 All robber flies are equipped with 2 compound eyes, in between which are 3 more simple eyes. Together these eyes give it an excellent vision to spot its prey even as it is flying. 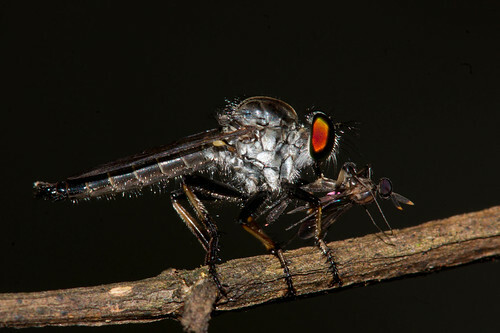 The robber flies are voracious predators and are capable of hunting in mid flight. They have the ability to even catch prey that are much larger than their own size, such as bees and wasps. These flies have spiny bristles on their legs and on the face. These help in the fly to overcome the defences of its prey. As noted earlier, they sit on their perch and dart out with lightning fast reflexes to capture their prey when sighted. They then return to the perch, eat the insect and set out to capture the next prey. It can detect the slightest movements from its perch and will fly out to investigate any signs of a prey. Robber flies have a short strong proboscis that they use like a lance. When the prey is seen, they fly out and intercept it in mid air before stabbing it with its proboscis. 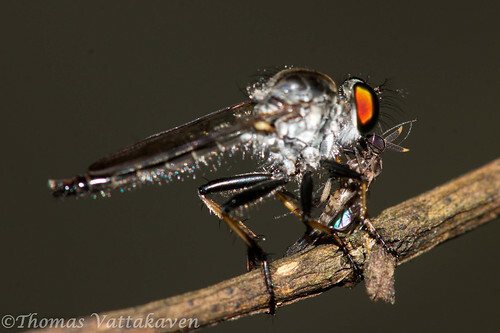 While returning to its perch, the robber fly injects its victim with a fluid which liquefies its insides, so that it can then be sucked out by the fly. 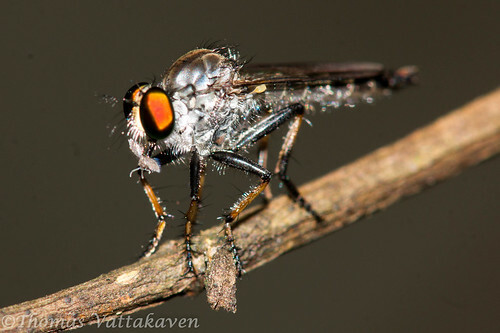 It is often possible to detect the perching point of these flies by spotting the dead sucked-out insect bodies that accumulate beneath. 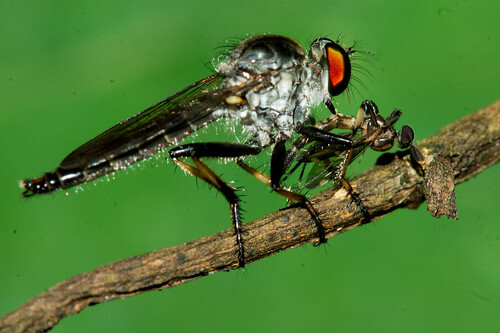 Some robber flies are considered a pest as they can feed on bees one by one until they decimate the entire colony! 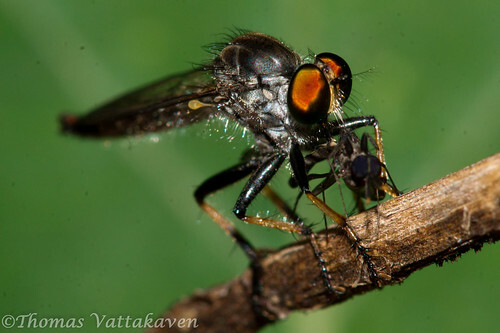 However, they also handle plant pests the same way and are thus also referred to as assassin flies. 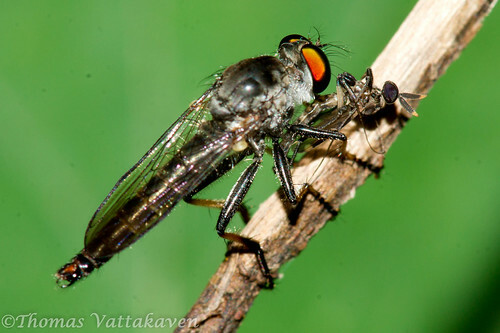 Their predatory nature is so dominant that when a males tries to court a female robber fly, if he is not careful, she will fly out, stab him with her proboscis and eat him! 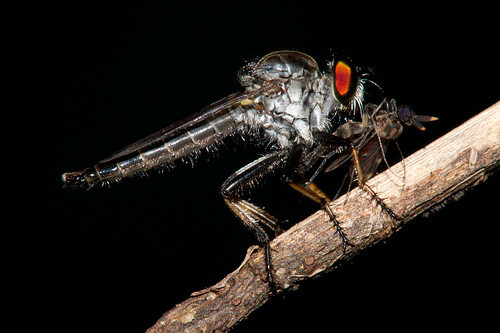 So now you know why a robber fly is so dangerous. It robs lives!